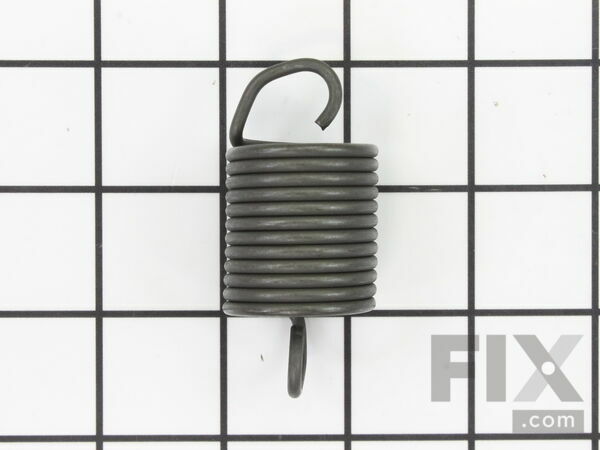 This suspension spring is used to support and balance the outer tub of your washer. The spring is sold Individually. Part Number WP63907 replaces: 63907, 63907D. 1. remove two screws holding control panel, then swing up. 2.remove two flat spring keepers on case top, disconnect the door switch connector at back or top case. 2 tilt entire case foreward and remove. replace the three springs and clips at bottom of tub. I had to bend the clips a bit more with a hammer and vise to make them more hook shape where they fit into the frame. 4. reassemble everything in the reverse order. I unplugged the washer but left the water and drain connected. On the bottom of the control panel there are two Phillips head screws you have to take out. Flip up the control panel and it will rest on its own hardware. Next pop off both golden locking tabs that are now exposed from underneath the control panel. Now the whole porcelain body will slide off forward. Use pliers to take off and replace the 4 Springs. Assembly is the reverse. Machine vibrates excessively when in spin cycle either with or without clothes in washer. I watched the video tip on this site and then preformed my repair. This was a very easy repair and my washing machine no longer vibrates excessively in the spin cycle. I used a 5/16 nut driver to unscrew the fasteners and held the bracket with my hand to ease the tension. Make sure to put the spring on the same way it came off the bracket. Put some grease on the spring tips for lubrication. I had a slight challenge getting the enclosure reinstalled on my machine that took most of the repair time. Thanks for the fast shipping and helpful video on your website. I appreciate saving money and time. Washer would shake and dance all over the floor during spin cycle even if load was balanced out. To make a long story short, I watched the video on this parts website and followed their instructions. Worked perfectly. It came apart, parts replaced and assembled just as video stated. Simple repair. Thanks so much for the video help and will always come to this site for help and parts. Can't beat the delivery time also, ordered on sunday and parts were here on tuesday. Video shows taking the control panel and case apart. Not needed in my case. Laid the washer on its back without taking any of the above apart. Made fixes just from the open bottom which had two of the springs with relaxed tension. 1/4" socket to remove the spring brackets, changed springs, reassembled. To get to the 3rd spring, laid the unit on its front causing that one to relax. Very easy. Now we have a washer which is quiet and staying in one place working like new ! Fantastic service and very fast delivery from this site !